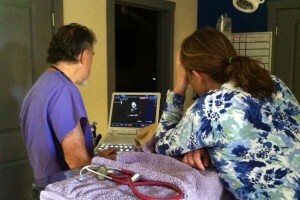 Dr. Ann consults with Dr. Alan Kay on an a pet’s ultrasound results. In the event of an emergency during office hours, please contact our office and we will advise you accordingly. In the event of an after hours emergency, proceed to one of the local emergency veterinary hospitals, both of which offer 24-hour care, including holidays.